Summary: Scrub King has more torque than any other scrubber, and the power you need to clean anything. Introducing the Scrub King, the portable, rechargeable power scrubber that cuts cleaning jobs in half. 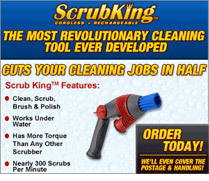 Scrub King has more torque than any other scrubber, and the power you need to clean anything. At nearly 300 scrubs a minute, its power does the work for you. Both men and women love Scrub King. It’s perfect for any job inside or outside your home. Try Scrub King risk free for 14 days.